Padded Buttonhole Stitch on Late Harvest, and Stitching Should be Fun! One thing I really like about Hazel Blompkamp’s embroidery designs is the combination of interesting techniques she includes in her pieces. Earlier this year, I wrote about Hazel’s Late Harvest kit from her book, Crewel Intentions. Yesterday, I put the piece, which I had already framed up for stitching, on the stand again, and did just a wee bit of stitching. The central element on this particular embroidery design is the stylized pomegranate, and that’s where the stitching starts. Earlier, I showed you the battlement couching that used in the center of the of the pomegranate (you can find a tutorial for battlement couching here – it’s a terrific filling technique!). The outside casing of the pomegranate is worked in three steps – stem stitch padding goes down first, and this is covered with a slightly spaced apart buttonhole stitch. Between each buttonhole stitch is a straight stitch in a different color, to create this striped, lifted outer rind on the pomegranate. I messed up on the spacing on the buttonhole on the lower half of the pomegranate – you can see the evidence in the very lower left corner of the photo. As I continued up the rind there and developed that stitching rhythm that takes a few minutes to get into, the spacing equaled out a bit. The funny thing is, the lower half of the pomegranate rind is the only part that’s actually visible in the finished design. The upper part is almost entirely covered by a stumpwork leaf. And so, you might think I’d go back and fix the spacing problem. Just as you might think I’d go back and fix my wonky battlement couching. But guess what? I don’t plan to! 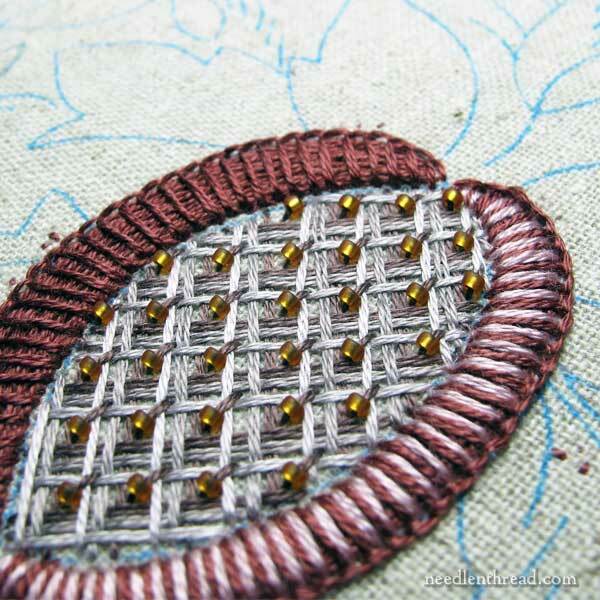 It’s easy to get overly obsessive about imperfections in hand embroidery. Sometimes, that over-obsessiveness can drastically reduce the pleasure that we should be experiencing as we stitch. I’m using Late Harvest to help me relax and enjoy stitching, and so I told myself from the beginning I was not going to obsess over small mistakes. And I expect to make small mistakes, because we all make them! I’m no exception. My plan is to work through the project and really enjoy the heck out of it, thanks primarily to Hazel’s ingenious combinations of fun stitching techniques. If I make a Big Mistake, I’ll fix it. But for little indiscretions that won’t be noticeable in the scheme of the whole piece, I’m not going to get picky. Sometimes, we have to remind ourselves that, for most of us, needlework is a leisurely pursuit – it’s supposed to be fun. If it’s frustrating, intense, stressful, then something’s amiss. This weekend, I’ll be working a little bit on this project and setting up a couple new projects that I’ll share with you in bits and pieces. I’m also reading through a new embroidery book that I’ll review for you soon, and, with the promise of sunny, dry weather on Saturday (first time in a long time), I’ll be doing a little workroom organization. I’m caving in and adding a couple new cabinets and a new table top (ala IKEA) to my workspace. I hope you have a chance to get in some fun and relaxing stitching this weekend! Wow! That stitch is so gorgeous – I love it. It’s so very elegant. thank you…. That is some beautiful stitching! I love the colors and the combination of stitches. And I never noticed the oooppss until you pointed it out. Hi, Helen! Well, I have the kit for Late Harvest, which came with the design transferred on the fabric, and the pomegranate is actually a little unbalanced, even on the fabric printed version. It’s slightly larger on one side than the other, and it’s a slightly lopsided oval. But I think this is all part of the design – it’s not meant to be perfect symmetrical, perfectly spherical, etc., so I think being off a bit in a tracing is quite ok! When the embroidery is finished, I’m sure it’ll look great! I’ve just discovered your website and it is such a treasure. Thank you so much for contributing all this knowledge to the rest of us. I am a beginner embroiderer and I really love it. I’ve tried all manner of other needle work (sewing, quilting, knitting and crocheting) and while I like all of them more or less, they never became a passion as embroidery is becoming for me. So I just wanted to say again: thank you for sharing your time, talent and knowledge. Hi, Dana! So glad you enjoy Needle ‘n Thread! Lovely stitching I really like the battlement couching and the padded stem stitch and buttonhole stitch, I didn’t notice the mistake until you pointed it out but it doesn’t really show. I’m glad you have found time to embroider for leisure, enjoy your self. I hope you take photos of your workroom organisation and new cabinets. I hope you have a great weekend. Thanks for sharing your new project with us and for your views on how not to worry about miner mistakes in embroidery. Mary, A bit off topic. On the home page you have scrolling Pictures,1-5. Number 2 is for your 75 tutorial videos. It shows you stitching up a purple flower. Looks like Crewel work. I have been following you since 2010. When I stumbled upon your black-work fish. I do not recall that one. When did you do that? Or do you recall the name so I can search it? Hi, Therese – I didn’t do that one. It was a placeholder (a stock photo) when my website was re-designed many years ago. At that time, I had very few clear photos of stitching in progress, so when I needed a title photo for the videos, the team that designed Needle ‘n Thread plugged in a stock photo. As we speak, the site is being re-designed once more (to meet mobile search standards), and I think that particular photo will most likely be gone by September…. I adore the beads. I just wonder: it seems the beads are attached by a rather long stitch that anchors those crossed threads. In the photo, the beads are nicely lined up at the lower left of each of the anchoring threads. But with handling, I would guess the beads could shift out of position. Hmm. As much as I love beads and add them all the time, I do like my beads to stay put and not scoot out of place. I know. . . . stitching is to enjoy, enjoy, enjoy. “…the color sense of a stinkbug” is quite possibly the best qualifier written since Hermione told Ron he had the emotional capacity of a teaspoon. Question – is the stitch padded buttonhole or padded blanket stitch? I know those are often confused by stitchers but this one looked like padded blanket stitch to me. Beautifully stitched! Buttonhole and blanket stitch are used interchangeably in most stitch dictionaries. Technically, buttonhole is worked close together, blanket usually has spacing between. But a real tailor’s buttonhole has a knot on the twisted end.